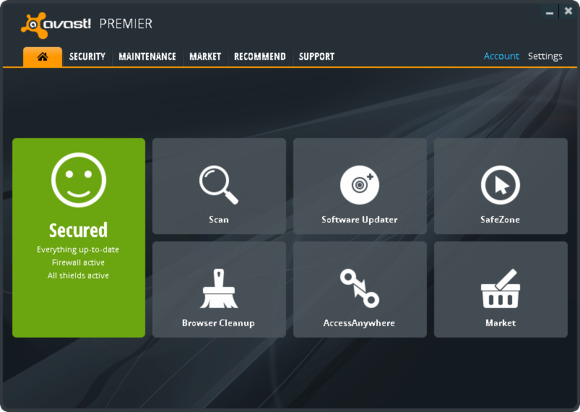 If you use Avast's security software, the company has something new for you. Avast released version 8 of its antivirus software line on Thursday, which includes major user-interface changes and new and improved features for both free and paid users. Prices remain the same for its Pro antivirus package ($40 per year) and Internet Security suite ($50 per year), and a new Premier edition sells for $70 per year. All are single-PC licenses, but Avast does offer discounted pricing when you buy licenses for more than one PC or for longer than a year. Avast's new user interface is designed with touchscreens in mind, and it should allow you to perform common tasks more quickly. Instead of seeing the mundane status page when opening the program, this new version greets you with a home screen with buttons to common tasks and components in addition to a button showing the overall status. 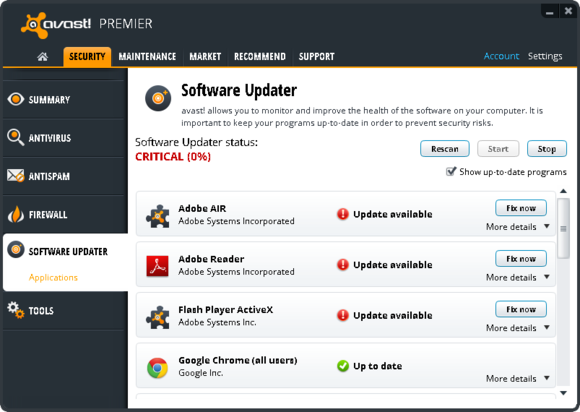 The new Software Updater feature tells you if any updates are available for any commonly exploited third-party software that you have installed, such as Java, Flash, and Adobe Reader. The free edition simply notifies you of out-of-date software, but in the Pro and Internet Security editions, you can click a “Fix Now” button that updates them for you. In the Premier edition, you don’t even have to bother; you can set it to automatically update these apps and add-ons. 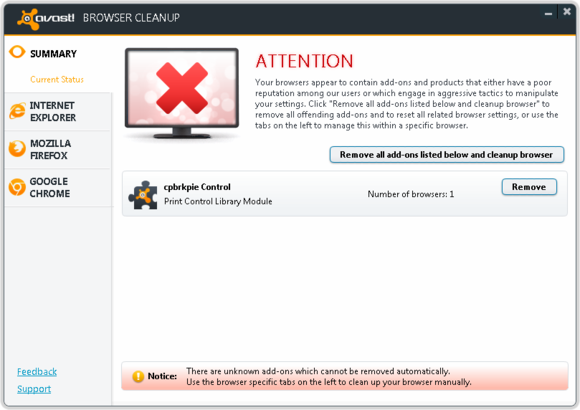 Avast's Browser Cleanup tool evaluates your browser toolbars and add-ons for those with a poor reputation—or those that use aggressive tactics to manipulate your settings—and helps you remove them. It scans toolbars and add-ons for Microsoft Internet Explorer, Mozilla Firefox, and Google Chrome, and shows a reputation rating for each. The new Data Shredder feature, available in the new Premier edition only, lets you securely and permanently destroy files, drives, and partitions. That way, if your computer or hard drive is stolen or if you resell/donate it, your files won’t be recoverable like they could be when you delete the normal way using the Recycle Bin. AccessAnywhere lets you get at your PCs from, well, anywhere. 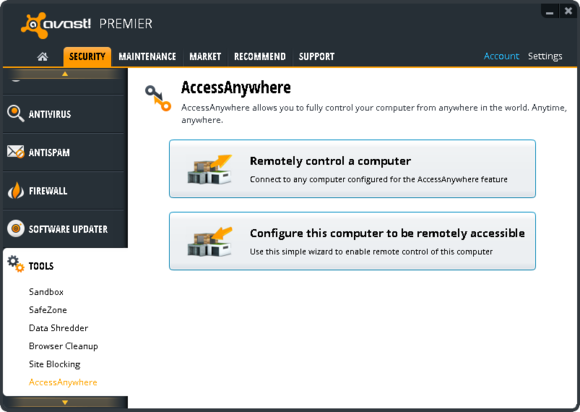 Another feature exclusive to the Premier edition, the new AccessAnywhere tool lets you remotely access your PC from your other computers running any edition of Avast 8 anywhere in the world. It lets you see and use the remote PC (similar to Windows Remote Desktop) but is easier to configure and connect, and it lets you transfer files between the PCs. In addition to the new features, Avast made many improvements to existing features. The Behavior Shield has been updated to better help detect malicious activity and virus database updates are streamed to you more often. Avast also made enhancements to the scanning, firewall, antispam, and reporting functions, in addition to adding full IPv6 support. Want to give Avast a try? You can always download the Free edition or evaluate its paid products with their 30-day trials offered for each. And if you’re already an Avast user, you can simply upgrade from version 7: right-click the Avast icon in the system tray and select Update > Program.